I don't often post about products and the like, but for these, I needed to make an exception. 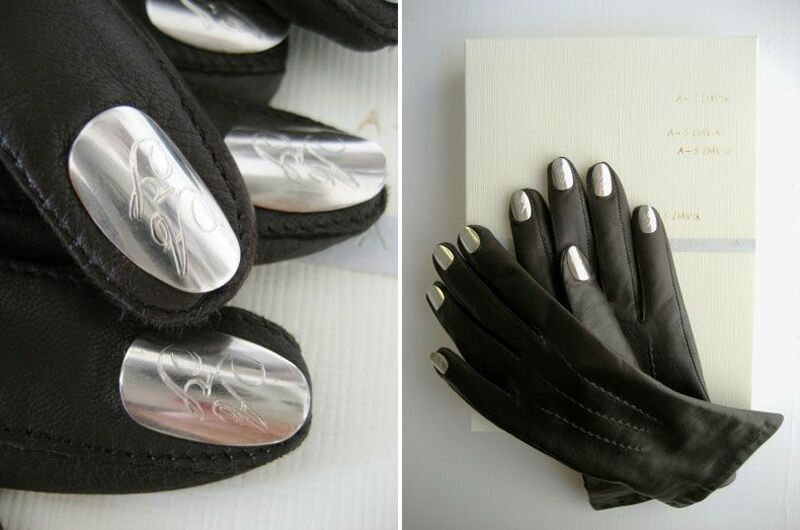 They're pretty basic gloves... with silver fingernails! (Almost like grills, for the fingers?!) Speaking of grills for the fingers, the designer also makes a similar set of fingernail overlays, in gold and silver, that are just plain COOL. I haven't wanted a piece of contemporary jewelry this badly in a while. By Saint Martin grad Anna-Sara Dåvik, available at APlace. I wonder if these are the same ones that luxirare has. Inspired by Schiaparelli's gloves with golden nails? Now that's a hand I'd like to shake.